Is Another 1,000 (or 3,000) Carat Diamond Around the Corner? In the fall of 2015, Lucara’s Kerowe mine in Botswana announced the discovery of the first gem-quality diamond larger than 1,000 carats in more than 110 years. Now, Lucara and others have been doubling down on the search for more mega-stones and believe it’s only a matter of months or a few years – not centuries – until another 1,000-carater turns up. Why are they optimistic that such a once-in-a-lifetime find could be repeated so quickly? Two reasons: economics and technology. Economics created the necessity and technology created the opportunity. Both have made it possible for the number of very large (over 50 carats polished) diamonds entering the market to increase sharply in recent years and open the possibility of new record-breakers. On the economic side, the 1990s brought an explosion in wealth around the world, particularly in regions with emerging economies including South Asia, Russia and China, while huge gains in financial markets buoyed wealth in Western economies and the Middle East. This fueled an appetite among the global wealthy for the few mega-diamonds that came up for sale each year. Until then, large diamonds often met a violent end after they fell into the mining crushers. There’s no way of knowing how many 100-plus, or even 1,000-carat-plus diamonds may have met that fate. That is because the per-carat price differential between large and commercial-sized [under 10 carats] diamonds was not wide enough that it paid for De Beers – then the dominant diamond producer – to retool its diamond recovery processes to save them. It sounds incongruous, but through much of the last century, diamond mining profits came from speed – recovering as many diamonds as possible in the shortest time possible. That meant blasting the kimberlite into small pieces, then using giant steel jaws to crush it into even smaller pieces to quickly separate diamonds from waste rock. De Beers’ executives used to acknowledge that any rough diamond larger than 25 carats stood a good chance of being blown up in the blasting process or crushed into small stones before hitting the recovery plants. 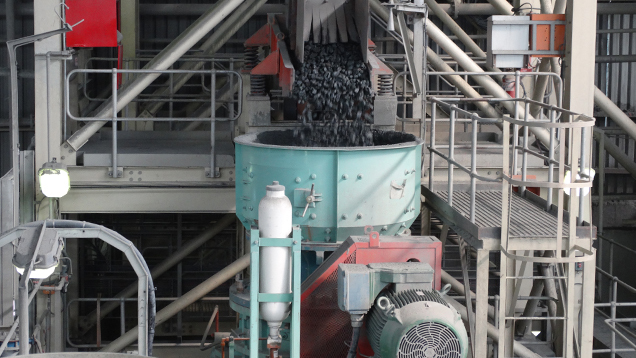 The ore conveyors were also run very fast to make processing very efficient, but more difficult to catch large stones before they hit the crusher. One De Beers executive liked to tell the story of how, at the then-partly owned De Beers Diminico mine in Sierra Leone, a worker noticed a flash coming from near the top of the conveyor that fed the crusher. He hit the emergency stop button, just in time to save a 968.9 ct crystal later known as the Star of Sierra Leone. “Another second and…” he said, clapping his hands together imitating the crusher jaws. As the 1990s progressed, however, competition – and prices – for the very few 50 carat-plus diamonds that came up for sale began to intensify as wealthy new buyers entered the market, especially at major auction house sales. One of the key price drivers was the emerging wealth in China and Hong Kong, where both Christies’ and Sotheby’s commenced major jewelry sales, with large diamonds as the cornerstone, before the decade’s end. These price increases – nearly four-fold between 1995 and 2005 for polished over 10 carats – reset the economic equation for diamond mining. Case in point. The Letseng mine in the southern African nation of Lesotho, whose signature production is very large diamonds, though at extremely low grade (about one carat of diamonds for every 100 tons of kimberlite, compared to one carat per ton at other mines, one-tenth that of most diamond operations), was reopened in 2004 after 22 years because increasing prices of such stones made the operation profitable. The investment has paid off. The mine has been profitable and claims six of the 25 largest diamonds ever discovered: 478, 493, 527, 550, 601 and 603 carats. 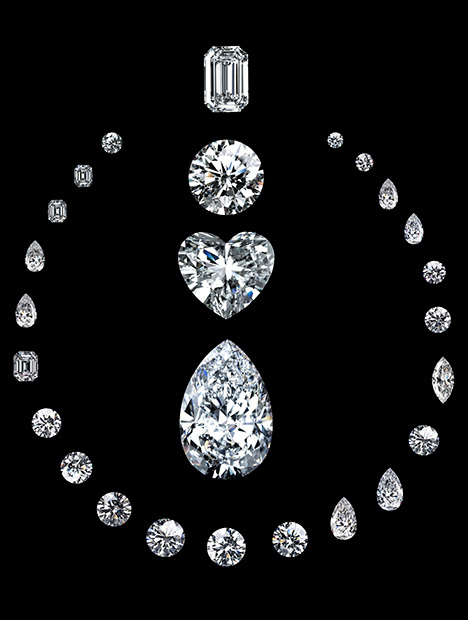 In addition, Letšeng recovers about 30 diamonds over 60 carats each year. The change in economics forced a change in the way mining companies process and recover diamonds. This meant introducing new technologies. The first technological advance was in the initial crushing. For many decades, big steel jaws were standard equipment at every diamond mine. They were brutal, but effective in reducing large chunks of kimberlite into manageable smaller pieces. As the new millennium proceeded, miners introduced “kinder, gentler” methods known as “autogenous,” which tumbles or grinds the kimberlite pieces against one another without the intense pressure generated by crushing. Such autogenous processes take several forms. Some employ a rotating/oscillating cone in the ore intake chamber that propels the kimberlite pieces into one another and against the sides of the receptacle. After Letšeng employed this system, recovery of 100 carat-plus diamonds more than doubled. Other processes employ large rotating mills that grind the kimberlite pieces against one another. For more details refer to Letšeng’s Unique Diamond Proposition in the fall 2015 issue of Gems & Gemology. The second component of new recovery technology is the use of X-ray processing, which replaced or complemented the century-old grease belt system. Diamonds would adhere to grease-coated conveyors and waste rock fell off the sides. The method was fairly effective, but De Beers and others have made a lucrative sideline of re-mining old tailings for diamonds that were overlooked the first time. X-ray processing has greatly improved the recovery rate and spared large stones by identifying them before they hit the crushers. XRL (X-ray luminescence) and XRF (X-ray fluorescence) units developed in the 1980s take advantage of the fact that diamonds will fluoresce when exposed to intense X-rays. The crushed kimberlite particles are dropped in a thin stream under a beam of X-rays. When a diamond fluoresces, it activates a photo-detector, triggering a jet of air that deflects the diamond into a collector box. Older X-ray recovery units identified diamonds by fluorescence alone, causing non-fluorescent diamonds (which include many large type II stones) and some fancy-color diamonds to slip through to the waste piles. More recent methods adopted at Letšeng and others employ X-ray transmissive (XRT) technology to identify large rough type II crystals trapped in kimberlite and eject them from further processing. The general principle behind XRT sorting is that diamond shows up as a much brighter image than other material; it does not rely upon a diamond’s transparency because it does not deal with visible light range. Even if the sample is sufficiently coated to be completely opaque, the XRT sorter is designed to detect it. It was such a unit that found the 1,109 ct Lesedi la Rona diamond. This new technology has enabled smaller mining companies, such as Gem Diamonds, operator of Letšeng, Lucara Diamond Corp. of Vancouver and Lucapa Diamond Co. of Perth, Australia, to recover massive diamonds that, until this decade, had been once-in-a-decade occurrences. In addition to the Letšeng, Lucara’s Kerowe mine in Botswana yielded the 1,109 ct Lesedi la Rona diamond, the second largest gem-quality diamond ever found, and an 813 ct diamond and 47 others over 100 carats. 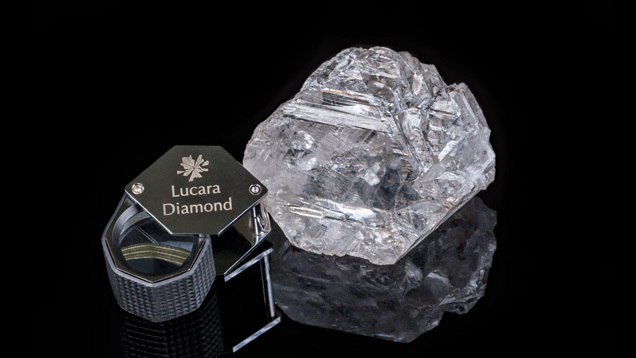 Lucapa, which operates the Lulo project in Angola, discovered a 404 ct diamond in February 2016. The 1,109 ct Lesedi la Rona diamond was the first gem quality rough over 1000 carats found in more than a century. Mining executives are certain there are others of that size − or larger − awaiting discovery. 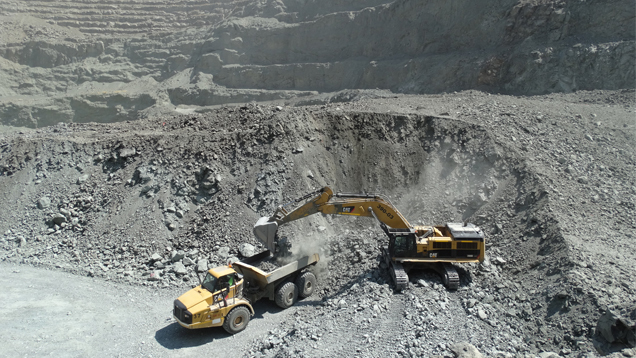 Photo courtesy of Lucara Diamond Corp. The mining companies acknowledge that they still have a way to go. Lucara executives believe a 374 ct diamond found a few days after the Lesedi la Rona diamond had been part of that stone before blasting. The largest diamond ever found was the 3,106.75 ct Cullinan from South Africa’s Premier mine two years after it opened in 1903. (That diamond originally weighed an estimated 8,000 carats but was broken by natural forces or blasting.) Premier (now named Cullinan) has been the world’s most prolific treasure house, yielding more than 750 diamonds weighing over 100 carats in its 113-year history. After De Beers sold the mine in 2007, the new owners, Petra Diamonds, have been investing in new recovery technology designed to recover diamonds even larger than 3,000 carats. The executives of Lucapa and Lucara say they, too, are vying to beat that record. A growing percentage of rough diamonds are now sold by tender and live auctions. Learn more about this effect on the rough diamond market, including pricing and the opening of a market that was once difficult to enter. A look at some of the impressive – and even historic – diamonds offered for sale at auction in recent years. 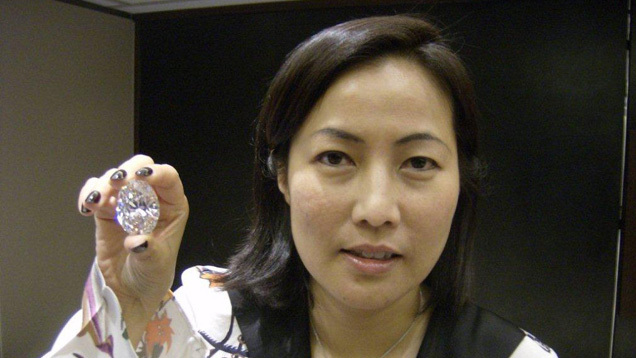 Big diamonds – really big ones – dominated the news in May, setting sales records for colorless and colored beauties. The world’s ultra-wealthy open their wallets even wider for the rare and fine in the first half of 2014.